We had some good times, iPhone 3G. You launched in 2008, and we promptly ding-dong-ditched EDGE and explored a wild new App Store. Hey, we even still had SMS bundled with data. Remember that? But Apple stopped selling you almost two weeks ago, and now AT&T says your time has come up. On Friday Boy Genius Report claimed to have obtained an internal AT&T memo that prepared employees for the $99, 8GB iPhone 3G to run out of stock. As of Sunday afternoon, AT&T's Web store has indeed run out of stock, though refurb versions of both 8GB and 16GB 3G models are still available for $49 and $99, respectively. A couple of FAQs in the memo tell employees that the company does not know when more iPhone 3Gs will arrive, and instruct salesmen to nudge customers towards the iPhone 3GS models at $199 and $299. 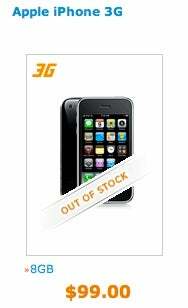 AT&T’s move is pretty unsurprising, considering that the online Apple store stopped selling the 8GB iPhone last month on the same day that Walmart dropped the price on the 16GB iPhone 3GS to $97. Steve Jobs is also widely expected to announce a new iPhone at the WWDC 2010 keynote next week, which Macworld will cover live.